Summary: A new study reports how sensory neurons detect fullness and nutrients after eating. Sensory neurons detect fullness and nutrients in the GI tract in surprising ways. Their findings, published May 26 in Cell, have potential relevance for understanding how bariatric surgery not only achieves weight loss but also diminishes Type 2 diabetes. In addition to weight loss, the work may be relevant for disorders of intestinal motility, such as dyspepsia. 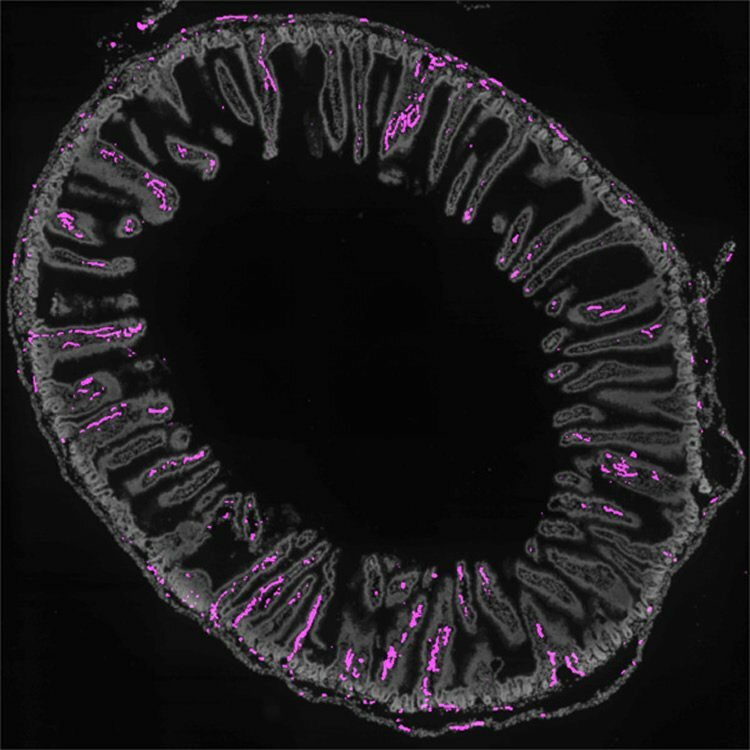 GPR65 neurons target the intestinal wall. NeuroscienceNews.com image is credited to Liberles lab/Cell. Funding: This work was supported by National Institute of Diabetes and Digestive and Kidney Diseases grant RO1 DK103703, a National Science Foundation predoctoral fellowship, a National Institutes of Health F30 training grant, a Harvard Medical Scientist Training Program T32 training grant and the Harvard/MIT Joint Research Grants Program in Basic Neuroscience. Image Source: This NeuroscienceNews.com image is credited to Liberles lab/Cell. Harvard. “That Gut Feeling.” NeuroscienceNews. NeuroscienceNews, 27 May 2016. Harvard. “That Gut Feeling.” http://neurosciencenews.com/sensory-neurons-gi-tract-4327/ (accessed May 27, 2016). Neural inputs from internal organs are essential for normal autonomic function. The vagus nerve is a key body-brain connection that monitors the digestive, cardiovascular, and respiratory systems. Within the gastrointestinal tract, vagal sensory neurons detect gut hormones and organ distension. Here, we investigate the molecular diversity of vagal sensory neurons and their roles in sensing gastrointestinal inputs. Genetic approaches allowed targeted investigation of gut-to-brain afferents involved in homeostatic responses to ingested nutrients (GPR65 neurons) and mechanical distension of the stomach and intestine (GLP1R neurons). Optogenetics, in vivo ganglion imaging, and genetically guided anatomical mapping provide direct links between neuron identity, peripheral anatomy, central anatomy, conduction velocity, response properties in vitro and in vivo, and physiological function. These studies clarify the roles of vagal afferents in mediating particular gut hormone responses. Moreover, genetic control over gut-to-brain neurons provides a molecular framework for understanding neural control of gastrointestinal physiology.